In a galaxy far, far away Walt Disney Pictures highly anticipated prequel (Solo A Star Wars Story) to the story of our favorite loveable scoundrel, Han Solo, is off to a slow start. But stick with it, because once young Solo (Alden Ehrenreich) escapes from his poverty-stricken, crime-ridden home planet Corellia, the film starts to gain momentum. Han vows to return to rescue his girlfriend, Qi’ra (Emilia Clarke) who is apprehended as they flee Corellia. Solo: A Star Wars Story, starts when Han Solo is a young man, still somewhat idealistic. It took this viewer a while to believe Ehrenreich would somehow grow into the role Harrison Ford made his own for so long. But the new kid’s devil-may-care-attitude and charm finally won me over. Han joins the Empire as a soldier, while yearning to fly. Unable to follow orders, he’s thrown into a dungeon with the Beast, who turns out to be our favorite Wookie (Chewbacca/Chewie, played by another new guy, Joonas Suotamo). The newly formed dynamic duo join outlaw Tobias Beckett (Woodie Harrelson) and his first mate (Thandie Newton) as they attempt to rob a rocket train loaded with priceless fuel cells. At this point, the movie zooms into the stratosphere, with more than enough CGI action, blasts, double crosses, explosions, more double crosses, daring escapades and escapes to keep audiences riveted to their seats. Although the film runs 2 hours and 20 minutes, it doesn’t seem that long. 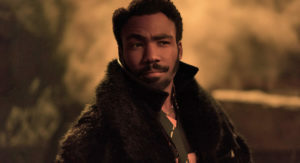 Along the way we meet such unforgettable characters as the notorious gambler Lando Calrissian (Donald Glover), his sassy robot pilot (Phoebe Waller-Bridge) and his legendary ship, the Millennium Falcon, hired by Beckett and his gang to steal valuable fuel cells to replace those lost in the original heist. They are actually working to repay murderous crime boss Dryden Vos (Paul Bethany), a Crimson Dawn leader whose protégé is Qi’ra, Han’s old sweetheart he left behind on Corellia. There are lots of twists and turns in this origin story, an action/adventure/drama/science fiction and fantasy helmed by Ron Howard for Walt Disney Pictures. It is rated PG-13 (for sequences of sci-fi action/violence), written by Lawrence Kasdan and Jon Kasdan. It opens wide in theaters May 25.